A rare opportunity to renovate a Grade II Listed building and return this semi-detached Georgian town house to it's former glory. 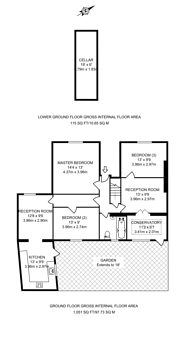 A three bedroom garden flat with an option to buy upstairs by separate negotiation. House next door has planning permission for significant layout changes and exterior improvements. 1,166 (108 Sq M) approx.